A luxurious three-piece collection formulated exclusively to combat hair fall and give you stronger, thicker, and fuller hair. You’ll fall in love with this kit — it’s 100% all-natural, smells delicious, and won’t make your hair feel dry! Why Hair Fall KIT ? 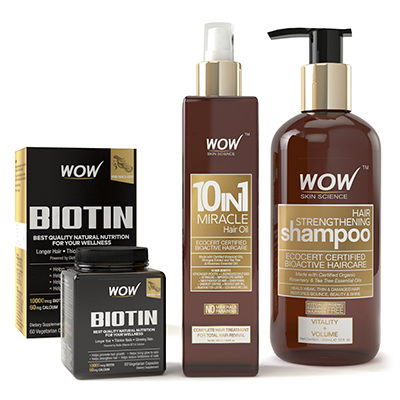 The products in this kit are carefully formulated by professionals to give you a powerful routine that combats hair fall at maximum effectiveness. 1. Start by taking our Biotin Dietary Supplement. This contains 10000 μg Biotin & 60 mg Calcium — the optimal level of these potent ingredients to maximize your hair growth. And here’s a bonus: it’s great for your nails and skin too. 2. Then control your hair fall with our 10-in-1 Miracle Hair Oil to get that gorgeous, bouncy hair. Formulated with the 10 most powerful, clinically proven bioactive ingredients, it transforms your stressed tresses into shiny, vibrant hair that leaves you looking as young and healthy as you feel. 3. Finish off strong with our Hair Strengthening Shampoo to reveal full-volume hair that feels as soft as velvet. Ingredients such as argan oil are slam-packed with vitamins, nutrients, and fatty acids that are crucial to regenerating hair cells. It’s the perfect pick-me-up — it smells delicious, and it’ll give you longer, stronger, and healthier hair. We pride ourselves on giving you top-quality products made from the best ingredients available. We want you to know exactly what our products are formulated with, so you can understand why it works and trust our products to deliver results. Stronger, Thicker & Fuller Hair — Easy As 1, 2, 3! 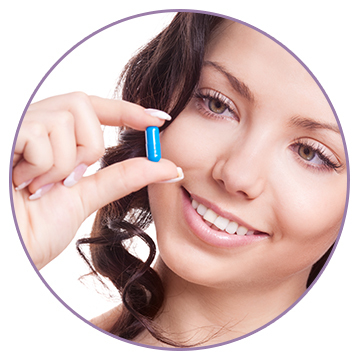 Take 1 capsule in the morning and in the evening at mealtimes, or as directed by your healthcare professional. Gently massage a small amount of oil into your scalp. Leave it on for at least half an hour. Wrap your hair up in a hot, moist towel for 15 to 20 minutes after massaging so the oil can penetrate even deeper into your hair roots for benefits. Leave this on overnight if possible, to maximize benefits. 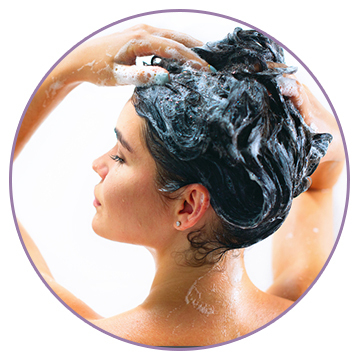 Wet your hair thoroughly with warm water and apply a generous amount of shampoo. Massage thoroughly into your scalp and hair for 2 to 3 minutes with your fingertips (not your nails!) and wash off completely. Follow with a cold water rinse and let your hair air dry naturally. 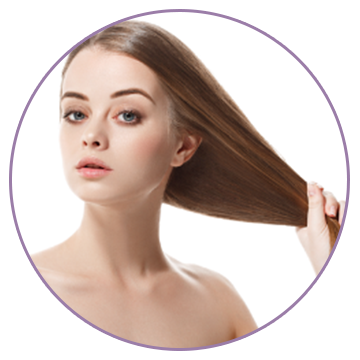 Biotin deficiency is scientifically proven to cause hair loss and thin, brittle hair. Since biotin is a water-soluble vitamin, your body cannot store it — this means that you need to consume a certain amount of biotin every day. Even though genetics are out of your control, a biotin deficiency can be fixed in no time. The right biotin supplement will do more than just correct a deficiency, our supplement is combined with calcium so you have stronger, healthier hair that’s also glossy, full of volume, and tangle-free. Caution: If you are pregnant, lactating, taking any prescribed medication, or have strong allergies, please consult your healthcare professional prior to using the Biotin Supplement. Note: Actual results may vary from user to user due to differences in hair texture. Results do not come overnight. Just like everything else, one has to follow a committed regimen of hair care and regular usage as advised to get visible results. © 2013-2018 Created by & All Rights Reserved - Fit and Glow Healthcare Pvt Ltd.